CHONGAR, Ukraine -- Ground zero of the latest confrontation between Ukraine and Russia was a sea of mud and not much else on Wednesday. 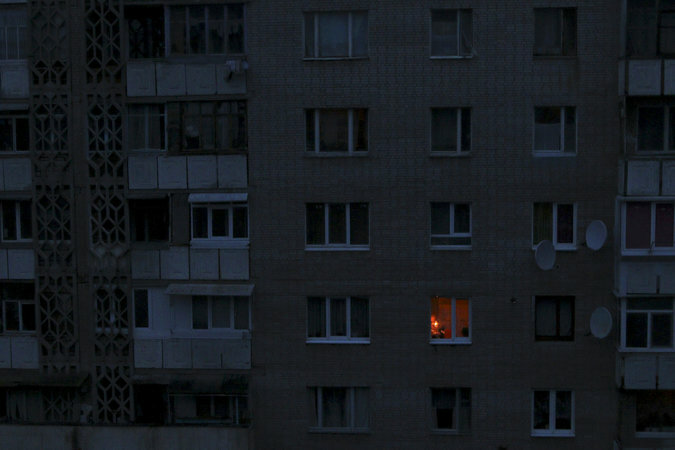 A single light illuminated a room Wednesday during a blackout in the city of Simferopol, Crimea. About half a dozen fighters, their boots sinking into a sodden field, were guarding the downed electricity pylons that were blown up last weekend, plunging much of the disputed Crimean peninsula and the Kherson region of mainland Ukraine into darkness. Activists from the Tatar minority and Ukrainian nationalists attacked the first repair crews and their police escorts seeking to restore the felled pylons, driving them away. The situation has been at an impasse since, with more than 1.2 million people in Crimea without power and no sign of any repair crews. “The people of Crimea are not supposed to feel like they live in a resort while the country is at war,” said Oleksiy Byk, 34, a chunky, bearded veteran who serves as the area spokesman for the Right Sector, a right-wing Ukrainian organization violently opposed to any accommodation with Russia. Millions were left without electricity after saboteurs knocked down power lines on Sunday. 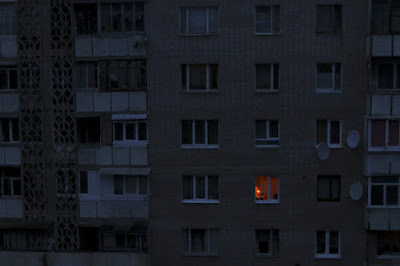 A man looked at electricity supply meters on Sunday at a house in Simferopol in the Russian-annexed peninsula of Crimea. Mr. Byk said he used to fight the separatists in the east, but after the cease-fire negotiated under the Minsk peace accords finally took hold in September, he and many other hard-core fighters gravitated to the area just north of Crimea. They are spoiling for a fight, since Ukraine rejects Russia’s March 2014 annexation of the Black Sea peninsula as illegal. A desultory economic blockade has been enforced since September, but the downing of the pylons seems to have prompted a new standoff between Moscow and Kiev, with each side finding new ways to increase the tension daily. On Wednesday, Ukraine’s prime minister, Arseniy P. Yatsenyuk, said the country was closing its airspace to all Russian planes, after earlier terminating all flights between the two countries. In a you-can’t-fire-me-I-quit move, he also ordered Naftogas, the state-run oil and gas company, to stop buying Russian gas. But the Russian gas giant, Gazprom, had announced earlier in the day that it was cutting off all gas supplies to Ukraine — not linked to the electricity issue, at least not publicly — because Kiev had not paid its bills. Russia also threatened to cut off coal supplies that some old power plants in Ukraine need to keep functioning. Russia has thus far not acted with overt hostility, probably because the Kremlin is preoccupied with the crisis over Turkey shooting down one of its airplanes. President Vladimir V. Putin did pause long enough on Wednesday to express dismay that the Ukrainian government was not addressing the problem. “I am surprised by the position of our partners in Kiev,” said Putin, who tends to use the word “partners” for most interlocutors. He mocked the idea that Kiev wanted Crimea back while victimizing its residents. Analysts said it was difficult for either side to act. Russia, under the threat of European Union sanctions for any aggressive action in Ukraine, is trying to extract itself from economic sanctions, not prompt more. Ukraine used to depend on Russia for gas, but after years of confrontations it has beefed up storage facilities and engineered reverse-flow supplies from Europe. Ukraine seeks to avoid further Russian aggression to stymie its political and economic stability, and an already unpopular government does not want to go against public sentiment. In Kiev, the main driver of the confrontation seems to be the leaders of the Tatar community who were exiled by Russia after it annexed the peninsula and who are now in Parliament as allies of President Petro O. Poroshenko. Mr. Poroshenko has not said anything in public directly about the electricity confrontation. The Tatars, a Turkic Muslim minority that now numbers about 300,000, have memories of crushing brutality under Stalin’s rule; thousands were forced into exile and returned to Crimea only after the fall of the Soviet Union. Many said that their people again faced systematic repression, and the initial demands to restore power included that all activists be released from jail, that the independent Tatar news media be restored and that international human rights monitors be allowed to operate. Here around Chongar, however, Tatar activists were not much in evidence. They seemed to have been assigned logistical tasks like providing food and housing for the men guarding the checkpoints on the road and the fallen pylons. The fighters were mostly veterans from the east who did not want to go back to civilian life. Roman, who would give only his first name, was the spokesman for the group guarding the pylons. Even though there were not many of them, he said, they could quickly summon reserves on standby should any repairmen or Ukrainian troops arrive or scavengers try to make off with the scrap metal. He said he was ready to take on any government forces who showed up. “I’m more experienced then them,” bragged Roman. The small contingent’s main problem was boredom and hunger. Their food stocks were running low and the constant rain had affected their generator — the light bulb in their tent kept going out. All the fighters in the area are a bit coy about who blew up the four main pylons. The official answer they give is “unidentified patriots,” an echo of the “polite people” that Russia used to describe the special forces soldiers dispatched to seize Crimea in March 2014. The fighters were allowing some repair work to proceed on one pylon to restore power to about 200,000 customers in the immediate vicinity, work that the state-run electric company, Ukrenergo, said would be completed as early as Thursday. Arsen Avakov, the interior minister, announced that there was no point in rebuilding them all until they could be protected. Crimea can generate about one third of the power it needs, and a trunk line to Russia meant to be connected by the end of December will not nearly close the gap. Ukrainian Government should start moving in the direction of increasing revenue so, there will be more sufficient fund for public sector, social projects and to increase wages of government workers. What are the steps? Mineral resources with strategic importance must be identified and part of those resources must be set aside for the government development through government procurement, some less lucrative should be privatized. It is important to work out a safe guard system which will allow to enforce government embargo on strategic mineral which will be placed on some countries in case of a war or international obligations. Good example of such mineral could be titanium. During the soviet time Ukraine had end cycle for mining and processing of titanium, it is a strategic metal. If such end cycle is created again Ukraine would be able to control 40% of the world marked of titanium. It would be one of the leverages to use on international arena. Now ore is exported to the country aggressor such as Russia and Russia has such leverage when it comes to aircraft building. In the sense airplanes build out of our ore could end up bombing Ukrainian cities, God forbid. So, some of generated income from privatization should be allocate for investing in such strategic area and foreign reliable investors from the friendly country should be invited to participate.